During the early 1980’s, Liverpool and specifically Toxteth was not necessarily a “fun” place to live!. The area was one of the most segregated in the UK, unemployment was at a 50 year high and race relations were tense. The predominantly black community, a strong and vital part of the cultural make-up of this major UK port city (which was incidentally built on the slave trade), was ghettoised within the L8 Liverpool postcode. Police brutality and victimisation of young black kids was rife and in the summer of 1981 the anger and mistrust between the two factions was at boiling point. Following the St Paul’s riots of 1980 in Bristol and the Brixton riots earlier in the year came Liverpool’s edition: the Toxteth riots (also know as the L8 uprising, depending on which side of the road you were standing). Several weeks after the violence that was to rock the city (pun intended) “Raiders of the Lost Ark” was released (!). It was after seeing this epic and entirely unrelated piece of Spielberg cinema that Toxteth residents Dave and Mervyn met. Dave remembers the two boys chattin’ about the film in their first conversation and also that their meeting was probably sealed with a ceremonial and bond-forming burning of a box of Swan Vestas. Those actions in the problematic summer of 1981 led to the creation and recording of their never-released album “Pest Control” 14 years later. 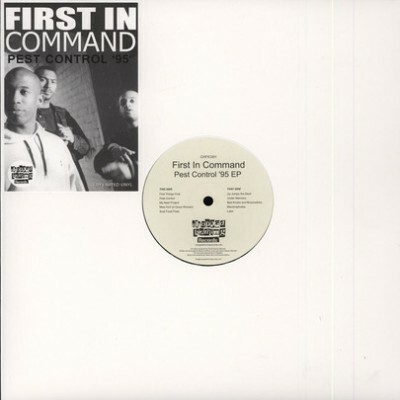 2 comments "First In Command ‎– Pest Control ’95 EP (Vinyl) (2013) (FLAC + 320 kbps)"